PORT HARCOURT – Confusion and sporadic violence blighted Nigeria’s tensest presidential election since the end of army rule, with opposition supporters disputing results on Sunday from a turbulent southern state even before they were announced. The opposition All Progressives Congress (APC) in Rivers state accused supporters of President Goodluck Jonathan of being behind killings of its campaigners, and denounced the vote there as “a sham and a charade”. Dismissal of the vote in Rivers – the center of Africa’s biggest oil industry – raises the prospect of a disputed national outcome and the risk of a repeat of the violence that erupted after the last election in 2011, when 800 people were killed and 65,000 displaced in the mainly Muslim north. Hundreds of protesters chanted “APC” outside the main INEC electoral commission office in Port Harcourt, watched by dozens of police. Senator Magnus Abe accused the ruling party of intimidation. ‎”There was no election in Rivers,” APC polling agent Achinike William-Wobodo told Reuters, calling for a fresh ballot. In a sign the opposition will challenge results elsewhere, the APC governor of southern Imo state, Rochas Okorocha, denounced on television the conduct of the election in his region and accused the military of meddling in the result. There was no immediate comment from INEC. Kano and Kaduna, the northern cities worst-hit by the 2011 violence, were calm. Voting in Saturday’s election was extended into Sunday at a relatively small number of polling stations after technical glitches hit voter ID machines. Islamist Boko Haram militants also killed more than a dozen voters in the northeast, while at least two people were shot dead in Port Harcourt, a city with a long history of political thuggery. The vote pits Jonathan against former military ruler Muhammadu Buhari for the favor of an electorate divided along a complex mix of ethnic, regional and in some cases religious lines in Africa’s most populous nation. It is also the first time since the end of military rule in 1999 that an opposition candidate has had a serious chance of unseating the incumbent, raising the stakes compared to previous years. Buhari’s APC reported violence in Rivers state and blamed it on “armed militias” backed by Jonathan’s People’s Democratic Party (PDP). PDP officials did not respond to a request for comment and it was not possible to corroborate the claim independently. 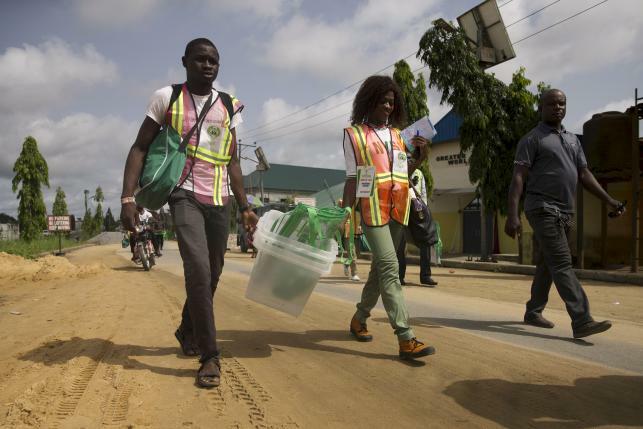 Islamist insurgents launched several attacks on voters in the northeast on election day, killing three in Yobe state and 11 in neighboring Gombe, including an opposition parliamentary candidate. The militants, who are trying to establish an Islamic caliphate, reject democracy and their leader Abubakar Shekau has threatened to kill voters. A string of military victories by troops from Nigeria and neighboring Chad, Cameroon and Niger has reclaimed much of the territory the Islamists controlled earlier this year, but they retain the ability to mount deadly attacks on civilians. Voting was beset by problems from the start as officials turned up late and biometric card readers, introduced to prevent the vote-rigging that has marred previous polls, failed to work. Even Jonathan had to wait 40 minutes. Electoral commission spokesman Kayode Odowu said just 350 polling stations out of 120,000 were still voting. “You can’t say that is too sizeable,” he said, adding that results would be collated within 48 hours of the polls closing. Anybody who announced results before the commission would be breaking the law, he added. Turnout appears to have been high, and with up to 56.7 million voters to process, results could take a while to collate. Buhari and Jonathan have appealed for calm and signed a “peace accord” on the eve of the vote, but many Nigerians still fear a repeat of the post-election violence that erupted in 2011, when Jonathan defeated Buhari.